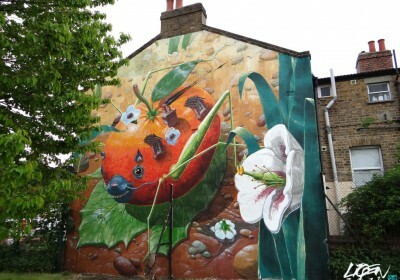 While in UK earlier this month, the Spanish-born Liqen painted a vibrant mural, Mandarina Chicharra, in South London in the Dulwich area. Covering the wall in the courtyard of a local school with his surreal imagery, the children will either be inspired by this hybrid orange and insect creature, or have bad dreams. 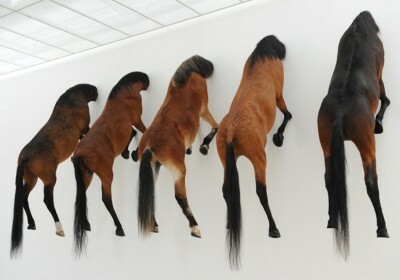 Take a a look from some other angles and enjoy the details below… Discuss Liqen here. Sam3 has been busy recently along the Mediterranean coastline of Spain in Costa Blanca working on some murals featuring his signature shadow figures. 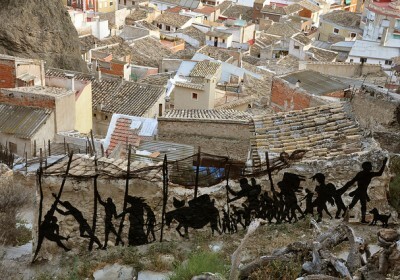 Along with the stunning piece with political commentary that refers to expulsion of the Moors in the Ricote Valley in the sixteenth century, painted on a rock face (seen above), there was also the silhouette of a man in a boat with pretty sweet placement taking advantage of the natural elements of the wall (seen below). Discuss Sam3 here. 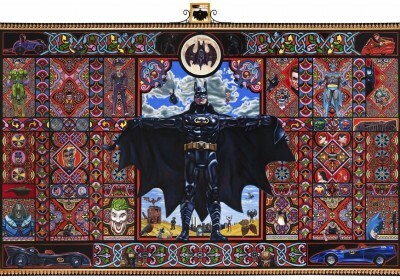 AM recently had the chance to visit pop-surrealist painter Hisham Echafaki‘s studio. Using acrylic and oil paint, the London-based artist loves exploring symetry and patterns, as well as depicting animals in a surreal environment, as shown in his kufic and butterflies series. 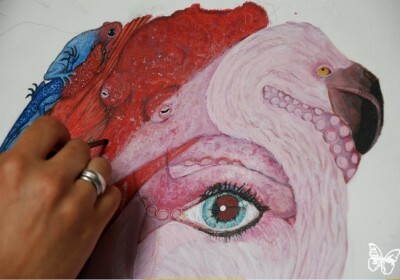 We were fortunate to document some of the painting process of his Anthropomorphic Bowie pieces as he prepared for the upcoming group show The Many Faces of David Bowie at the Opera Gallery London. Photo credit: Butterfly. 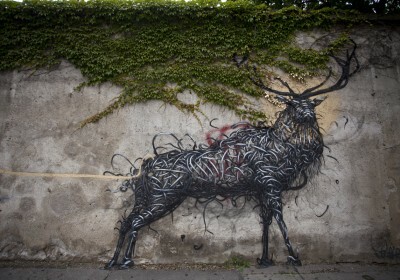 The prolific artist DALeast has struck again, this time in Vienna. 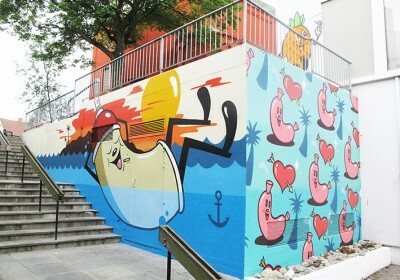 The South Africa-based Chinese artist painted a mural that draws from his roots as the title of this latest piece is “-“, the a character that means “one” in Chinese. Painted over some scattered graffiti, the work featuring his animal characters rendered with his kinetic brushstrokes blends in nicely with the wall. Take a look at more photos below… Discuss DAL here. 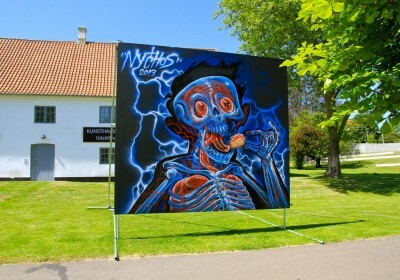 Earlier this month (June 1-8), the Viborg International Billboard Painting Festival kicked things off with new work from Nychos. 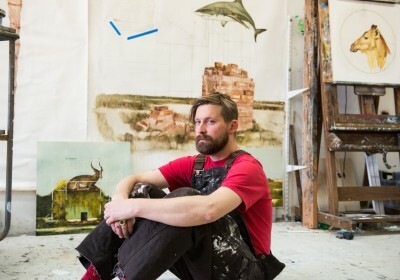 The Vienna-based street muralist brought his cartoonish anatomical aesthetic to Denmark and painted a series of works on billboards & walls, ranging from painterly techniques to graffiti. Other artists scheduled to make appearances include Blade, John Howard, Horphe, Ken Sortais, Christian Dinesen, and Anders Reventlov Larsen. 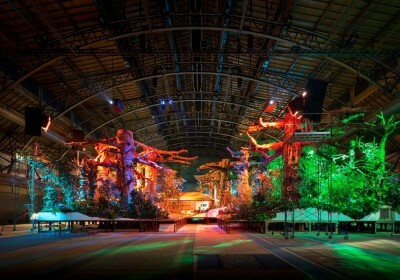 Check out more photos of Nychos’ work below… Photo credit: Henrik Haven. Discuss Nychos here.